Rabies is increasing in wildlife in Boulder County, placing both humans and animals at risk for this deadly disease. There is no cure for rabies, and it is nearly always fatal if untreated. If you think you may have been bitten by an animal, immediately and thoroughly cleanse the wound with soap and water and seek medical attention. The best way to prevent rabies is to reduce the risk of contact with an infected animal. Keep wild animals from entering your living space. Keep pets and livestock up-to-date on rabies vaccination. Do not touch any wild animal that is exhibiting unusual behavior. See where positive rabies cases have been identified in Boulder County using our interactive rabies map. Wild animals can travel great distances, so it’s important to take precautions against rabies even if there have not been any rabid animals near you. 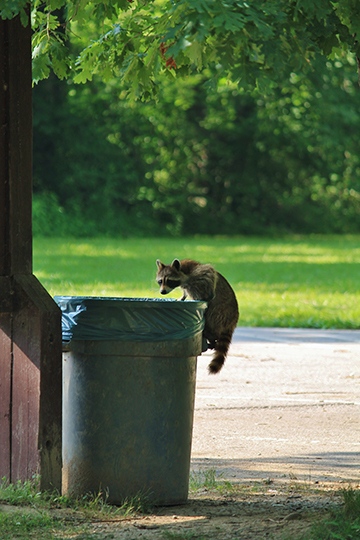 Never throw away a dead animal that may carry rabies unless you have spoken with public health first to have them determine the need for testing. Specimens are usually sent to the state lab for testing regardless of the condition of the animal. Rabies specimens should not be frozen as it can delay the test results. In some cases, animals that do not normally carry rabies will be tested (for example, a coyote that bit a person or a pet). Some favorite skunk hideouts are foundations of houses or basements. The most effective control for skunks is to bury wire mesh 18″ underground around these structures, or use sheet metal or concrete to seal access points. Skunks don’t like loud noise or light; therefore, you can also try to shine a light into their hiding places. Animals are attracted to food and harborage. If you eliminate these, you should eliminate the problem. Bats carry rabies and should never be handled. Bats can find their way into houses, causing odors, noise, and nuisance conditions. Bats can fit through cracks 1/4″ wide. The best prevention is to ensure all cracks around your structure are well-sealed. If bats are found living in or around your house, you will need to seal off their entrance to your residence when they are out foraging at night. Do not attempt to handle bats. Safely contain the bat without touching it and call 303-441-1564. If bitten or scratched by a bat, contact your physician or local medical emergency clinic and Boulder County Public Health at 303-441-1564. Clean any potentially injured area with soap and water immediately, and apply alcohol or iodine. If the bat is not captured, you will need preventative treatment immediately. Make a reasonable attempt to capture the bat, taking precautions with heavy gloves or tongs; do not damage the bat’s head. If your pet catches a bat or you find one in your house, contact Boulder County Public Health at 303-441-1564 to determine if testing is necessary.